They are large, they hiss, groan and belch. Somewhere deep within are pounding hammering beats. They are big, black and covered with soot and dust. They seem alive. Locomotive 488 crosses the Rio Chama. The engine is a Baldwin 2-8-2, the latter representing the wheel arrangement. There are two leading wheels on one axle, eight powered and coupled driving wheeels on four axels and two trailing wheels on one axle. 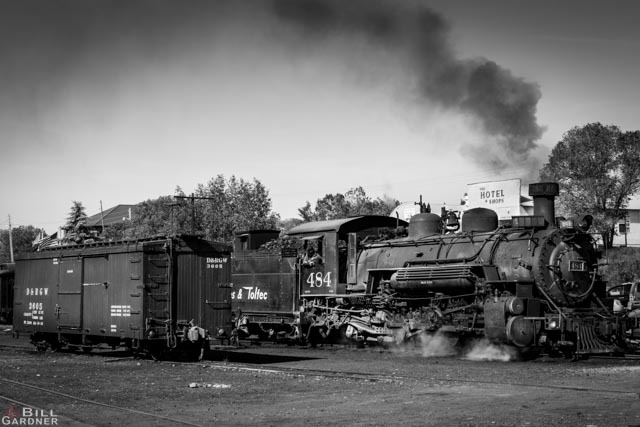 They are the steam locomotives of the Cumbres and Toltec Scenic Railroad in Chama, NM. Before the morning run the high mountain air is a mélange of smells with wafts of hot oils, pockets of warm humid steam and coal smoke. As strange as it may seem in this age of hyper-safety, almost everyone can experience these sounds, smells and sights when strolling through the railroad yards. Self-guided walking tour brochures are available at the depots in both Chama and Antonito. The yard in Chama houses one of the most physically complete yards of the steam era. C&TSR locomotive 484 works in the Chama, NM rail yard. The locomotive is a K-36 with the tractive effort of 36,200 pounds force (161,026kN). It is a walk back in time. 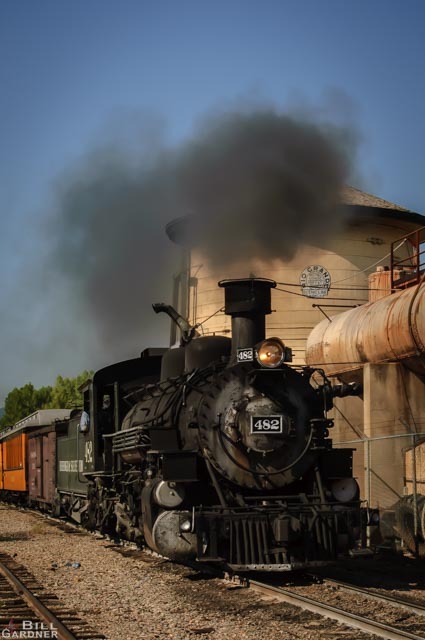 The smell of the coal smoke and the gritty feel of the fine cinders are the same as the riders felt when the first train arrived in Chama on December 31, 1880. 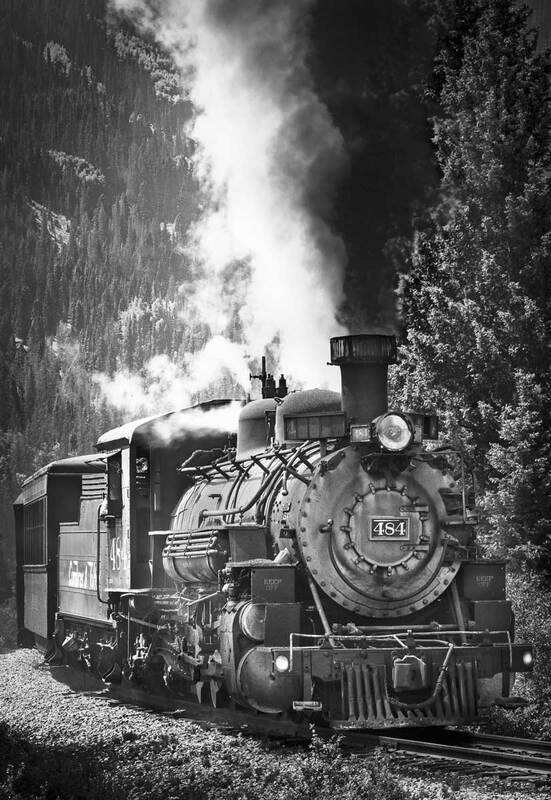 The steam locomotive and passenger train leaves the Chama Valley climbing toward Cumbres Pass, 10, 015 feet. the highest railroad pass in the United States. 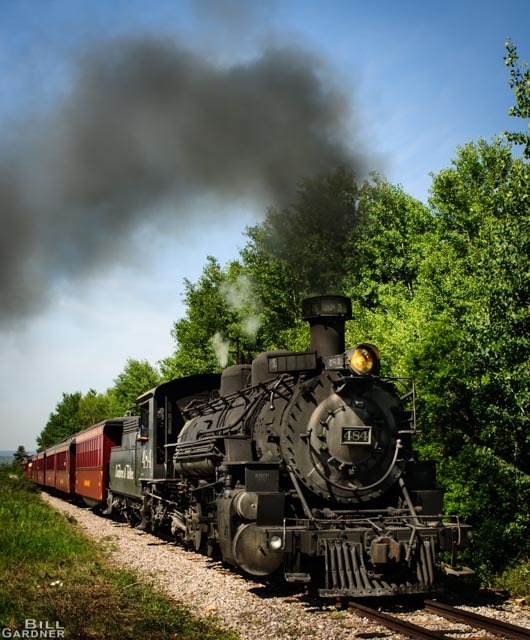 The railroad has five fully restored steam engines and a variety of rolling stock in what may be the best preserved steam railroads in the nation. A sixth locomotive, D&RGW #168, has been moved from Colorado Springs to Antonito where it is being restored to service. When the restoration is complete #168 will be the oldest and most authentic steam locomotive operating in the country. The locomotive was built in 1883 for the Denver & Rio Grande Western line. The narrow gauge track is built over some of the most scenic country in the Southwest. The trains travel through the remarkable and beautiful San Juan Mountains. The locomotives are working hardest to pull the train to the highest mountain pass reached by rail in the United States, the 10,015 foot (3,053 meter) high Cumbres Pass. It takes about two and a half tons of coal and 4,000 gallons of water to climb the 4% grade out of Chama to Cumbres Pass. Locomotive 488 and passenger train rolls pass a water tank in route to Antonito, Colorado. The locomotove weighs about 286,600 (136,000) pournds with full tender. On a typical roundtrip the fireman will shovel about five to seven tons of coal into the locomotive’s firebox. The amount depends on the fireman’s skill and the differences in the locomotives. The train crosses between New Mexico and Colorado 11 times between Chama and Antonito. The C&TSRR operates the 64-mile passenger line between Chama and Antonito, Colorado generally between the end of May and the middle of October. Depending on the weather a special Christmas train is operated in December. One train each day leaves Chama and Antonito with stops at Osier for lunch. A full round trip on the train is a two-day excursion, taking about six and a half hours each day, spending the night in either Chama or Antonito. Perhaps the most popular day trips are the one-way and half-way trips. A bus ride back to the starting point usually takes a little over an hour. Another popular rides are the Dinner Trains. The round trip runs between Chama and Cumbres leaving about 5:00 PM and returning around 9:00 PM. The Denver and Rio Grande Railroad was originally constructed in 1880 as part of the San Juan Extension serving the silver mining operations in the San Juan Mountains and southwestern Colorado. The narrow gage term comes from distance between the rails, three feet. The more common distance, which became the standard in the United States is four feet, eight and a half inches (4’,8 ½ “). In 1969 the Denver & Rio Grande Railroad filed for abandonment of the rail line. 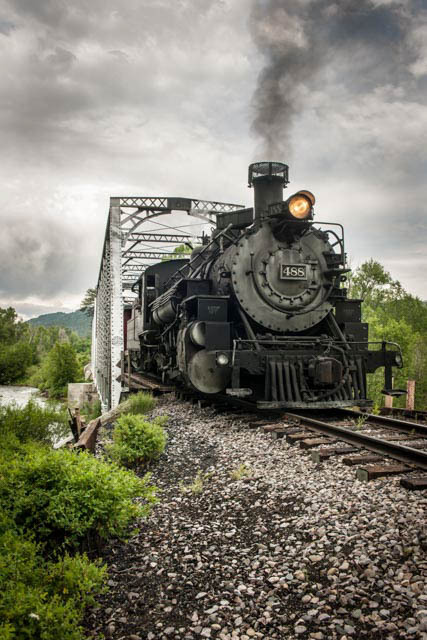 The most scenic part of its route, as well as the equipment and buildings, were saved when the states of Colorado and New Mexico joined together forming a bi-state agency to form the Cumbres & Tolec Scenic Railroad Commission. On a typical roundtrip the fireman will shovel about five to seven tons of coal into the locomotive’s firebox. The amount depends on the fireman’s skill and the differences in the locomotives. The Cumbres & Toltec Scenic Railroad was designated a National Historical Landmark in 2012 by the National Park Service. Built in 1880 little has changed. It is the longest remaining portion of the Denver & Rio Grande Western Railroad narrow gauge track in the nation. The Friends of the Cumbres & Toltec Scenic Railroad, Inc., is a non-profit, 501 (c) 3 tax-exempt organization with the goal of preserving and restoration of railroad. An important and rewarding activity is the volunteer labor to maintain components of the CT&SR. The Friends conduct work sessions each year in May, June and August. Hundreds of volunteers participate in the work sessions, many of whom sign up in more than one session. The scope of the work includes the traditional Friends activities of car restoration and painting, the stabilization and restoration of virtually all of the historic structures along the line, general clean-up and aesthetic improvement of the property, and interpretation of the railroad through walking tours and docents for the passengers. If hands on experience is your goal contact the Friends of the Cumbres & Toltec Scenic Railroad, Inc. at, 4421 McLeod NE, Suite F, Albuquerque, NM 87109, Fax – 505-856-7543, info@cumbrestoltec.org. Or visit https://www.cumbrestoltec.org/.